Sure, there are elaborate heroes who do things to change the world. But you don’t have to change the whole world, all you have to do is find someone in need, and change their world. If a child asks you to come play ball, or Barbies, or jump on the tramp, or swing them, or read them a book, or tell them a story, and you stop and do it… you’re their hero. If you see someone at the checkout counter who didn’t bring enough money, and you step in and make up the difference… you’re their hero. If you see someone on the side of the road and help them change their tire, or jump-start their car, or pull them out… you’re their hero. If you see someone having a bad day, put your arm around them, give them a smile, and offer some encouragement… you’re their hero. If you’re always the one to look on the bright side of things, to point out the positive, to provide energy and spirit to those around you… you quickly become their hero. If you see someone new in your neighborhood, in your school, in your church, or in your office, and you take the time to get to know them, ask them questions, make them feel welcome, and be their friend… you’re their hero. Being a hero doesn’t always require heroic effort, just the right effort at the right time. And usually the amount of effort required is vastly disproportionate to the impact you have. Sure, there are big things that you can do (and big things that need to be done), but more pervasive are those little opportunities that constantly surround us where we see someone in need, step in, and help. Our environments are composed of hundreds of opportunities such as this. The building blocks of heroism. So look around you, and be a hero. https://life.engineering/wp-content/uploads/2018/08/life-engineering-logo-lg-color-web.png 0 0 Rusty Lindquist https://life.engineering/wp-content/uploads/2018/08/life-engineering-logo-lg-color-web.png Rusty Lindquist2009-05-07 16:35:482009-05-07 16:35:48What does it take to be a hero? In regards to the concept in this post how by small and simple things are great things brought to pass. I offer the following practical encouragement. As a parent, consistently fulfilling the simple “can you play with me”, “can you read to me”, or “can you lay by me”, means more to that child, builds more love, as well as closer and more lasting relations, than any grand plan you’re likely to set in motion. In business, consistently and successfully tackling the opportunities at your doorstep will generate more revenue, build more good will, and give you more traction than all of the big ideas that never come to fruition. As a boss, maximizing the little chances you have to build up an employee, encourage a peer, empower a worker, recognize effort, provide context, and share your vision, will do more to build morale and boost productivity, than nearly anything else you could have planned to do. As an employee, consistently taking all of the little opportunities in front of you to go the extra mile, to take just a little more responsibility, to share the recognition, to add one more layer of refinement to whatever your doing, will do more to move you forward in your career and build fulfillment than most anything else you can do. As a child of God, the little opportunities right in front of you to choose the right, to lift your standards just a little, to say no when you should say no, or say yes when you should say yes, to repent, to be just a little more humble, a little more compassionate, a little more understanding, and a little more proactive, will give you more spiritual elevation than you can imagine. As a spouse, it’s consistently taking the immediate opportunites to say “I love you”, or tell them how nice they look, or recognize their efforts and achievements, to validate their concerns, to just be quiet and really listen, to communicate, to go on a date, and to be with them that will bring you the most enriching, fulfilling, and wholesome relationships. In whatever you do, live in the present, and the future will shape itself. How very often we tend to look for the “grand plan”, the big things we can do to make a big difference, all while the small opportunities that are ever-present ever pass us by. We look beyond the mark. But big plans seldom work out, and big ideas seldom take off, whereas the little things, the more achievable things, the more straightforward things, the more immediate things, those things that are right in front of us, are those things that really matter and really move us forward. It’s great to dream, it’s better to do. After all, it’s usually the cumulative effect of so many little things, done persistently, and done well, that creates greatness. In our lives, whether in business or as parents, as we pay closer attention to making the most of the little opportunities that lie right in front of us, we will move naturally towards the dreams that matter most. I firmly believe that there’s no amount of feel-good fluff that can compare to the self-propelling power of pure principles in getting us through the hard times. The internal strength, divine direction, and eternal perspective one gleans from studying and pondering pure doctrine is incomparable and irreplaceable. Still, “variety is the spice of life”, and often motivation and strength can be found all around us. In times such as these, when so many face so much, we may do well to absorb motivational messages from many more sources. As you face the challenges that are bound to be thrown at you, just remember… don’t give up, you are loved. I was in Orlando Florida last week, presenting some new software I’d been working on at a large tradeshow, when something I saw totally captivated me. One morning, the group of us was following the masses toward the conference center entrance to get our badges scanned. It was a gorgeous day, and I was looking around, enjoying the surrounding beauty when I spied the most amazing plants. These plants lined the front of the conference center. As I walked, I noticed that these plants would grow along the gound, sprouting above-ground roots that would slither out in all directions attempting to find nourishment from their surroundings. Apparently, at some point, they’d find a sufficient source of nutrients, and the plant would be strong enough to start growing upward. And then I came to this one. I was captivated. But it wasn’t the novelty that captivated me as much as it was the apparent symbolism. This was the only plant of its kind. It grew straight up. 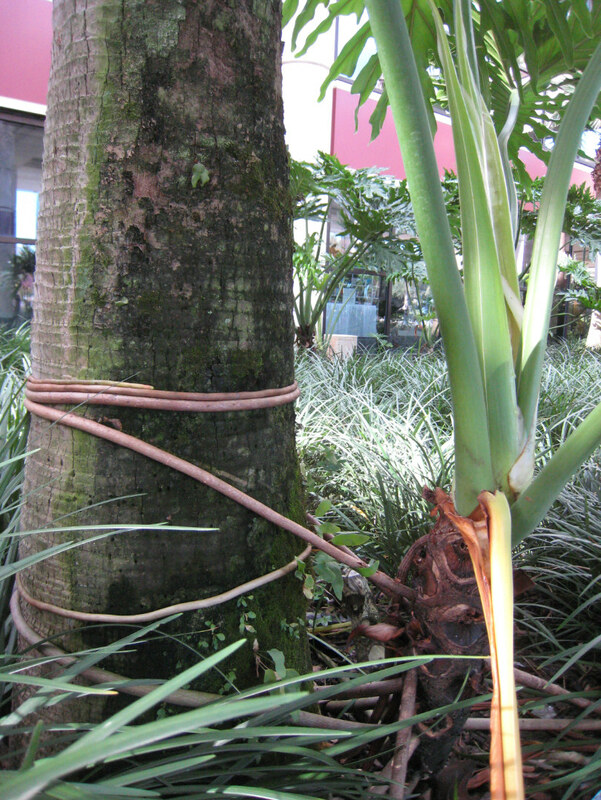 Rather than sulking along the ground, seeking nourishment, one of its tendrils had found a large, neighboring palm. It had then wrapped its root around this tree multiple times, giving it direction, strength, and protection that the others lacked. Before I was befuddled with the frantic nature of the tradeshow, I had a brief moment to reflect upon the message this plant had to offer me. In life, some people choose to “go it alone”. Sometimes that choice is forced upon you, and you find yourself scrambling for nourishment (spiritual, emotional, or otherwise). In either case, it’s a constant struggle for the most meager upward gains, and you end up spending much time and effort moving on a more lateral course, constantly reaching out in every way to find support and strength. But we have been provided pillars of strength, and we should wrap ourselves around them. By so doing, they provide us direction, strength and protection that ensure our upward growth. For each of us those pillars may differ. Sometimes it’s a close friend who somehow seems so grounded, or whose testimony is so sound. Sometimes it’s a religious leader. Sometimes it’s a family member. Someitmes it’s something inanimate, like the scriptures. Often, it’s the Savior. But whoever or whatever you find, keep them close. Wrap yourself around them, and let them give you strength. The physical principle of gravity, that objects of lesser mass are pulled toward objects of greater mass, has a spiritual shadow. If you surround yourself by those people, places, and things that are of greater spiritual strength than you, you’ll be naturally pulled upward by them. But be careful, for the opposite is also true. May each of us find our pillars of strength, and wrap ourselves around them. P.S. For a greater explanation of this take on “gravity”, see my post here. For more about how you are shaped by your spiritual ecosystem, click here. Thanksgiving is one of my favorite seasons. I prefer to think of it as a season anyway, and not just a holiday. A holiday is just that, a day. It comes and goes. But thanksgiving (like Christmas and Easter) I prefer to make a month-long event, if not longer. It’s a reminder that I have much to be thankful for. So, I’d like to dedicate this month to several posts about gratitude. What is it? Why is it important? What role does it play in my eternal progression? And most importantly, an open and public expression of those things for which I am most grateful. I’ll let this post serve as a sort of “summary” where I’ll post links to all subsequent posts. But I’d also like to find out what YOU’RE grateful for. Please, try for a moment and reflect upon your life, and let us know what you’re grateful for this Thanksgiving season. https://life.engineering/wp-content/uploads/2018/08/life-engineering-logo-lg-color-web.png 0 0 Rusty Lindquist https://life.engineering/wp-content/uploads/2018/08/life-engineering-logo-lg-color-web.png Rusty Lindquist2008-11-04 19:48:032008-11-04 19:48:03Thanksgiving… Giving thanks… what are you thankful for? No, this isn’t “they don’t care how much you know, until they know how much you care”, although I think there is some substance to that, but rather about how to lead people by making them care. The most effective, long lasting leadership is about getting people to care, not compelling people to obey. Leadership by compulsion is only as enduring as your ability to make those who follow you fear you. But once you’re not there, or your influence over them is diminished, the obedience you’d once created will likewise disappear. But, if you can help people care about the principles you want them to obey, by appropriately communicating to them the context of those principles, and the natural ramifications to one’s obedience or disobedience to them, then they’ll obey by choice. They’ll obey because they see the whole picture. Hence, the importance of communicating context. When asked why (yes, even by your kids), “because I said so” is not an acceptable answer, at least at first. The better, more enduring alternative is to get them to see the whole picture, and see it clearly enough that they care. How often do you hear that phrase? More importantly, how often do you say it and mean it? Stop and think for a minute… how much DO you care? Do you care about life? Do you care about religion? Do you care about your job? Do you care about politics? Do you care about sports? Do you care about the weather? Do you care about a hobby? Do you care about progression? Do you care about understanding others? Do you care about others at all? Do you care about what those around you are trying to tell you? Do you care about what you’re going to do tonight? The rest of your life? Do you care about music? Do you care about the direction of your life? Do you care about your spiritual state? Do you care about eternity? Do you care about what your spouse is going through? Do you care about helping, and making a difference? Do you care about how you feel when you look in the mirror? Do you care about what media you consume? Do you care about what food you consume? Do you care about a pet? Do you care about nature? Do you care about your education (regardless of age)? Caring is one of the simplest, yet most magnificent of motivating powers. Caring gives you energy, purpose, hope, enthusiasm, passion, commitment, perseverance. None of those can exist without caring. In fact, no positive, healthy, or forward-moving emotion can exist without first caring. What’s more, those who care more, experience more. More life, more joy, more hope, more love, more fullness. As a people, I am convinced that we have got to care more. So I ask you, what do you care about? Try caring a little bit more, see what happens. Rusty Lindquist https://life.engineering/wp-content/uploads/2018/08/life-engineering-logo-lg-color-web.png Rusty Lindquist2008-10-22 17:17:002008-10-22 17:17:00What do you care? This past Monday, the pointer on our family night spinner rested on me for this week’s lesson. We were having some neighborhood friends over, and I felt inspired to teach a lesson based on one of my favorite blog posts (“It is what you make of it“). I think the lesson was received well (it’s tailored for little kids), and wanted to share it with you, in case you find yourself needing a quick lesson sometime. First, after our (rather rambunctious) song and prayer, I asked if anybody knew how snow is created? Fortunately for me, nobody did, and they were all interested (it had recently snowed). I animatedly explained how moisture in the sky builds up in the clouds, around little dust particles, and this moisture continues to accumulate (gesturing now with my hands) until suddenly the droplet gets heavy enough that it falls “aaaaaaaahhhhhhhhh….kerrrsplat!” to the earth. But, if conditions are just right, and its cold enough, that little water droplet freezes instantly, and as it does, it flattens and “crystallizes”. These flat crystals then float gently down to the earth as snowflakes. I tried to illustrate and describe just how miniscule one of these snowflakes are, and then asked them to try and visualize how many snowflakes it would take to cover the whole table. And then how many to cover the whole yard, then the whole city, etc. Then how many it would take to blanket that same area in 3-4 inches. By now, they’re getting a sense of scope, appreciating for the first time just how many snowflakes there must be. Then I make the point “Did you know, that out of all those gazillion snowflakes, no two snowflakes are the same?” Every snowflake is entirely different, unique from one another in very special ways. Then, I changed the subject entirely (keeping children on their toes is crucial to a well-orchestrated family night, LOL). At this point, I took out our rather gargantuan box of jumbled legos. These are legos from numerous long-gone lego sets. I had everybody gather around the table, and then I scooped out a handful of random legos, and dumped them in a small pile in front of each person (adults included!). “Okay”, I instructed, “Now what you have to do, is build something out of your legos”. I explained that they must use every single lego (no lego left unused). They could build anything they want, but every lego had to be used. At this point, they all set to work, everybody absorbed in their own little unique challenges due to the mixed variety of legos they’d received. As I had hoped, at least one of my kids got to a tough point in their building, and asked me for help. I’d then say (for emphasis) in an over-loud voice “I’m so glad you asked me for help, I’d love to help you”. (I’ll come back to this later). After everyone had finished, we took turns showing off our creation, and for each person who successfully used all their legos, I gave them a treat. “How many of you ended up having lego parts that you just didn’t like?” A bunch of raised hands. “I know exactly what you mean. Didn’t you find that there were some legos parts you’d been given that you just wanted to stash away, to hide, so that you didn’t have to use them? I mean, think of how easy it would have been if you could have given away those unwanted parts, or even better, traded them in for parts you wanted even more! “But, in the end, when you look at that shelf full of lego structures, isn’t it those specific parts that make each structure so unique? So curious, so entertaining? “Our lives are just like those lego structures. Each of us are children of our Heavenly Father, and just like the snowflakes we talked about earlier, he has made each of us to be totally different, completely unique. In doing so, we were each given our own bag of ‘parts’. “These are the parts with which we must build our lives. Sometimes we find we have parts that we just don’t want. Parts that we’d rather hide, or even better exchange! But these are the parts that Heavenly Father has given us, and he has done so because he loves us, and he understands exactly who we are, and what kinds of challenges can make us stronger. I then shared my testimony to them, as I do to you, that we are indeed children of our Father in Heaven, that he indeed loves us, and that all the parts he has given us, both the wanted and the not-so-wanted, are ours, and were given to us for a wise purpose in Him. We should accept and embrace those parts, work to build our lives to be strong, beautiful, and unique, and help others recognize the value of their less-wanted parts. As we do this, we will find our relationship with our Father growing stronger, as we turn to Him for help, we will find that our lives don’t appear less-desirable, but rather MORE-desirable, and the time will come when he will embrace us for the lives we’ve built out of the parts we’ve been given, and then we too, shall earn a great reward. I hope you can find value in this lesson, whether you share it with your family or not, for I firmly believe it is true. Last night, I was at the kitchen sink doing the dinner dishes, when my 2 year old came tromping in holding up two Polly Pockets and saying “RAAAAAWWWRRRRRRR” in his growliest voice. I burst out laughing, and then said, “Alex, what does a Poly Pocket say?”, and seeing my apparent enjoyment, he heartily repeated “RAAAAWWWRRRRRR”. I laughed, and went back to the dishes (this is life in a house with 5 little boys and only 1 girl, lots of dolls with tattoos, no heads, etc.). I didn’t even bother correcting him, knowing full well that as soon as he left the room, it’d be back to “Polly Pocket vs. T-Rex”, or Buzz Lightyear, or whatever. But as I stood there thinking about the incident, I couldn’t help but smile at the symbolism. We all tend to simply go about our lives, looking at everything through whatever lens we’ve created for ourselves, and seeing it for not exactly what it is, but for how we can fit it within our own “world-view”. Nobody likes to discover things that shake them out of their comfort zone, or calls into question life-long beliefs, and so we often try to make sense of things in a way that doesn’t disrupt our long-held beliefs. I’m sure when Peter went fishing on that special day, he had no intention to simply “abandon his nets” and follow some stranger. But that’s what he did. Sometimes we ALL must truly try and peer beyond the surface of what confronts us, and attempt to see them as they are, and not what we want them to be. Sometimes, as with Peter, we may even be required to abandon our own nets, in order to follow the Savior.